Why spend thousands of dollars on a double door fridge / freezer when you can have all the same benefits for a fraction of the cost? Meet the Danby Duo! By combining Danby’s single door 11 cu. ft all-refrigerator (DAR110A1WDD) and our 8.5 cu ft all-freezer (DUFM085A2WDD1), you will never run out of refrigerated space again! When paired together these two units are less than 60 inches high and 48 inches wide but still provide almost 20 cu. ft. of storage. Both units come with reversible doors allowing you to set up your fridge / freezer combination however you want with the doors opening from the inside. The side-by-side fridge / freezer design also allows you to split the refrigerator right down the middle. This leaves one side designated for fresh foods and the other side for frozen items. Why the Danby Designer all-refrigerator? This model has plenty of refrigerated storage and the prestigious Energy Star rating paired with the high-tech mechanical thermostat means it will cut back on your power bills. The stylish appliance features a single door with an integrated handle and a clever reversible hinge which allows you to set it for right or left-handed opening. What’s so great about the all-freezer? There’s plenty of interior room in this upright freezer and organizing is made easy with the four convenient door shelves and additional pair of quick-freeze shelves. The freezer defrosts quickly due to the handy manual-defrost system and the easy-to-use mechanical thermostat. The door, which features an integrated handle, can be quickly and easily adjusted for either left or right-handed opening. Don’t need the freezer but want double the refrigerator space? Make your own Danby Duo by spicing things up to suit your needs! 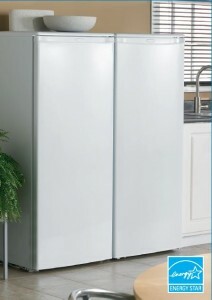 Purchase two of the Danby all-refrigerators and place them side-by-side as a double door fridge! The Danby Duo units are a great alternative for kitchens, cottages, apartments, offices, basements and more! Click here to watch Morgan, our Digital Marketing Manager show off the Danby Duo on our Danby YouTube channel! Cookware 101: understanding the anatomy of a pan.